Gespoint Translator Professional is a specific management system for freelance translators, easy to use, which simplifies your daily work and increases your productivity and control. Project management is simplified and optimized with the automatic generation of work orders and the task tracking tools offered by Gespoint Translator Business. The registration of a new project can be done automatically by importing a file from the most common CAT tools (Trados, Transit, etc.) or by accepting a previous quote. It is also possible to manually enter budgets, projects and invoices. From the project, you can attach the source and destination files and import the CAT tools analysis files. You can automatically generate and receive the work orders for the translators and send the translated files to the client. The tracking of each project or task can be done in different ways within the program. 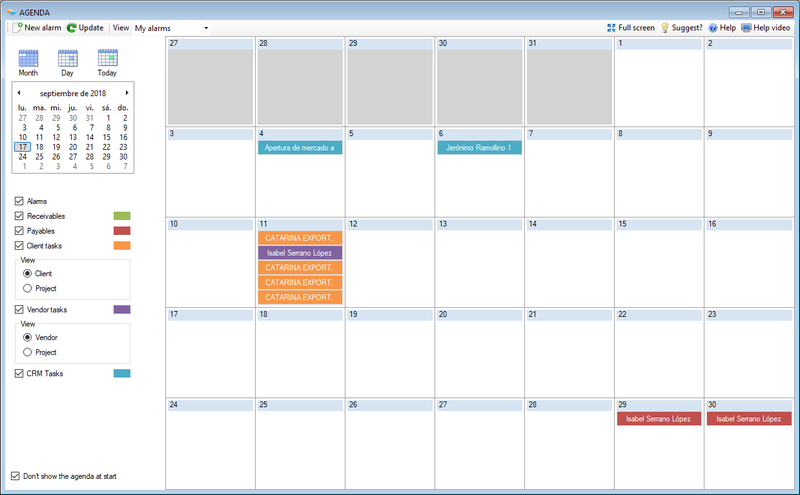 Through a visual calendar, using a planning or with different task lists. Do you need to outsource tasks? Adding the sub-contracting module will convert your Gespoint Translator Professional into a Gespoint Translator Business obtaining all the possibilities of subcontracting and advanced project management of the Business version. This module can be added at any time keeping all the previous data entered in your system. The Automatic Reminder Model System automatically sends reminder emails to Project Managers, Customers, etc. Notifying them of the upcoming expiration of tasks or projects, availability of new files on the Intranet, expiration of invoices, etc. The notices are fully customizable by the agency and can be activated or deactivated for each client, employee or supplier. The delivery and billing of a finished job is done by a simple mouse click, automatically generating the invoice, its accounting, taxes and collection forecasts associated with the project. The system can also notify the client of the finished work and send him an email with a link so that he can download the files of the finished translation. The financial and accounting control of the agency is done automatically while making invoices and collections to customers or invoices and payments of translators or suppliers. The program automatically assigns all expenses and income to each project. The program allows you to easily record all sales, purchases, collections, payments, payments, advances, general expenses (payroll, social insurance, rents, etc.). 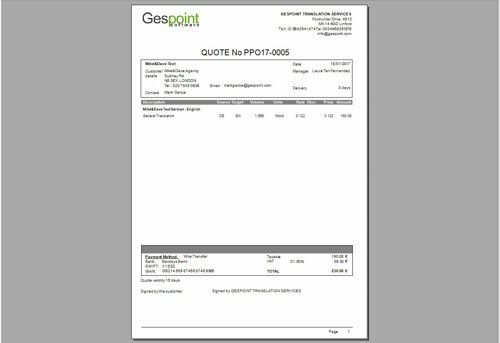 The treasury module of Gespoint Translator allows you to control the collections and pending payments of each project and invoice, the advances, as well as the balance and risk of each project, client and supplier. 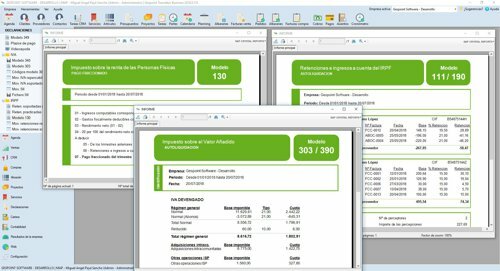 The declarations module allows you to generate all the necessary information for the presentation of your taxes. Automatic generation of model 303 of VAT, lists of withholdings supported and passed on, models 130, 111, 115 and 190, book register of invoices issued and received, file 340, 347, 349, etc. Gespoint Translator, through the Facturante platform, communicates directly with the AFIP Argentina and obtains the CAE of each invoice, issuing a receipt 100% valid for AFIP directly from the program. 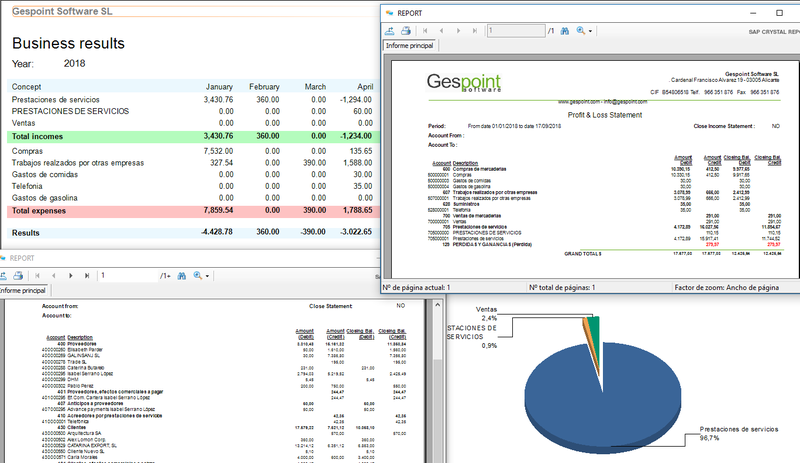 Gespoint Translator is adapted and updated continuously for the new regulations (SEPA, SII, RGPD, E-Invoice, etc.) in the countries where the program is available. Gespoint Translator allows to make quotes in a fast way, speeding up the process. Specify the language of origin, the destination language, the type of work to be performed (translation, interpretation, etc.) and the number of units needed (words, hours, documents, etc.). The program will automatically calculate the price to be applied according to the client and the rates of the agency. Duplicate quotes or tasks to quickly create quotes of multiple languages of origin and / or destination. You can attach to the quote the documents that the client requests to translate through the document management integrated in the program. All members of the agency will automatically access shared documents regardless of the physical location of the file. 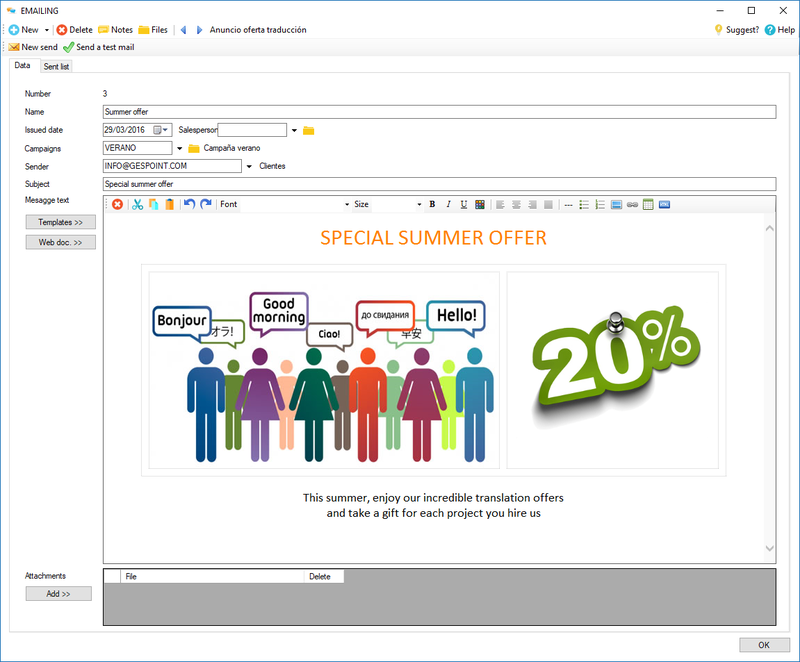 The integration with the different mail programs existing in the market (Microsoft Outlook, Mozilla Thunderbird, etc.) 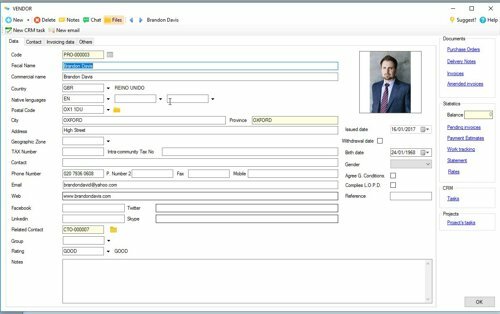 allows the client to send the quote as a PDF attachment directly from the program and is registered when and who sent it. The automated tracking of the quote allows to know at all times the status of the same, registering all the communications made with the client during the negotiation. The CRM module allows you to record and track all commercial tasks performed with a client or quote, optimizing the commercial work of the agency. Once a quote has been accepted, it becomes a project with a simple mouse click, transferring all the previously defined data and the attached documents to the project. The Customer Relationship Management module (CRM) helps you identify, attract and retain your customers. With the CRM, it improves customer relations because, at a glance, you can consult the history of interactions with any customer, when you have spoken with him for the last time, what products he has purchased, emails sent, his budgets, claims, etc. to be able to offer what he needs at the right time. The control of sales opportunities allows identifying and recording the opportunities that arise from customers or potential customers, indicating the competitors with which we fight, the economic value of the opportunity, the estimated probability of closure and all actions (emails, visits, etc.) that each commercial has made or has planned to do to win that opportunity. The CRM tool also makes it possible for sales teams to relate more effectively with customers and contacts, easily sharing information in better coordinated work teams. The Emailings Generator allows you to send mass emails to all your contacts and track their responses, identifying who has opened an email, what images or links have clicked, what day and time they saw it, how many times they clicked on each link, etc. Get sales faster, with a centralized place to store and update all information, record interactions and monitor the progress of opportunities. The multi-currency module of Gespoint Translator allows you to work throughout the program with different currencies and exchange rates. It is possible to define prices of customers and suppliers according to the currency used by each one, issuing quotes, orders, invoices, collections, payments and accounting entries in different currencies. The program automatically records and accounts for differences, positive or negative, caused by exchange differences when operating with different currencies. Working with different currencies in translation projects is agile and transparent for the user. It is possible, for example, to define a project with a sales currency for the customer, different from the local currency used by the agency. Another added value that the quality system brings to your company is how to handle complaints, claims and suggestions. 1) Give an answer in time and manner expected by the client. 2) Follow up on claims. 3) Carry out analysis of the results of the claims and detection of improvements. 4) Management of continuous improvement. The Gespoint Translator Automatic Reminders Model (ARM) guarantees that no important task is forgotten. The system automatically monitors the due date of each task of the projects in progress and sends emails reminding the next deadlines to the parties involved in a project (Project Manager, Translator, Employee and/or Salesperson). The system can also notify the person in charge of a new project or Project Manager that a new project has been assigned to him and he must start managing. 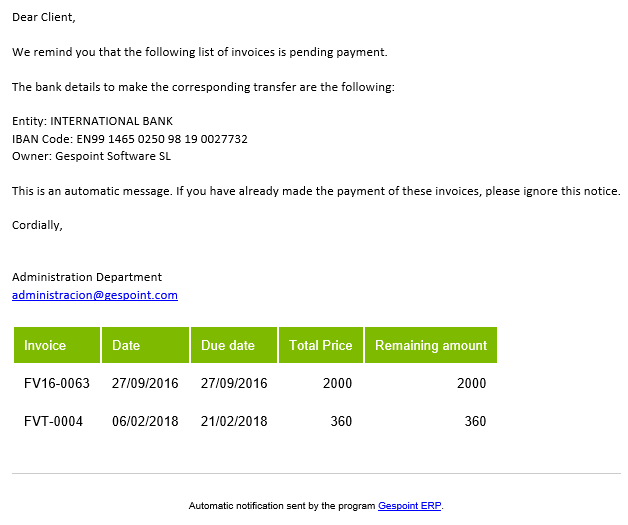 The system can be programmed to automatically remind customers of the due date of their invoices, facilitating and automating the collection management of the company. The ARM system allows you to define the text of the notices that will be sent to employees, customers and suppliers, as well as the period of notice with which they must be notified. It is possible to define the notices in different languages so that each client, employee or supplier gets the notice in their language. It is possible to select which customers, suppliers or employees send or not send automatic notifications, being able to use the reminder system only with the selected people. As of May 25, 2018, the new General Data Protection Regulation (GDPR) approved in April 2016 by the European Union is mandatory for all companies in the European Union. - Permissions per user: Possibility of defining for each user, to which data has full access, read-only access or access denied. - Integrated Document Management: Allows you to store all documents sent and received regarding requests, consents, revocations, etc. - Management of main entities: Customers, suppliers, employees, potential contacts, etc. - Protected fields: Possibility to freely define the fields on which to make an activity record. - Activity log: Record and history of all changes made to any protected field. - Right to portability: Possibility of exporting all the information of any entity (client, supplier, contact, etc.) to standard formats (Excel, Word, PDF, XML, etc.). Fill in the following form with your information and we will contact you to make a free presentation of the program without any commitment on your part.